I am now officially 35 weeks pregnant and have decided that it's about time I start working on getting the baby bedding ready for the vintage bassinet I posted about the other day. I am having a little trouble deciding what I want to do in terms of color and pattern. 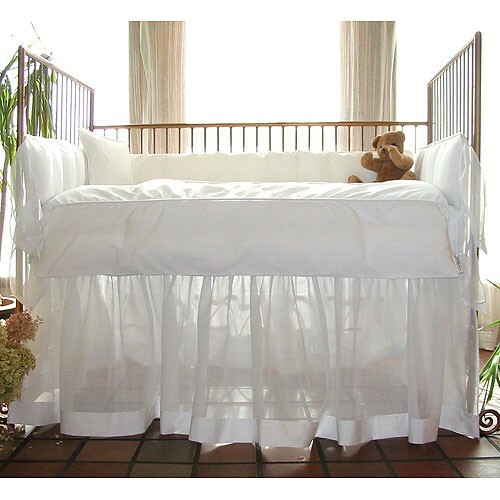 But, what I'm really loving, is just a simple soft white or cream color pallet...I think it would suit the vintage style bassinet perfectly. Off to the fabric store... hopefully I will have some photos ready to show you in a week or two! I'm with you, I love the plain white! Especially since you have a vintage bassinet. I'm planning on doing the same with our bedding, and the fact that plain white sheets are super cheap is an added bonus! i love that you're making the bedding! that's what i dream of doing when i have kids, I can't wait to see what you come up with! That simple baby bedding set is very beautiful, but I'd suggest going with something that actually has a little color and pattern to it. One babies thrive from patterned bedding, but also, babies make tons of unexpected messes in the bassinet and on a totally white baby bedding set, you'll see every stain and smear, but on printed and colored bedding you won't. I'd recommend checking out some of the baby bedding at http://www.simplybabybedding.com/ because they offer lots of choices! That's where I got mine.